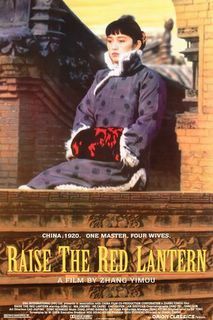 Raise the Red Lantern, a magnificent film that confirms Zhang as a world-class director, may cause him more grief. The setting is northern China in the Twenties. The teenage Songlian (Gong Li) marries the fiftyish Chen (Ma Jingwu), a rich and ruthless man who already has three wives. Each night, servants raise a red lantern in front of the door of the wife whom the master decides to reward with his sexual favors. The struggle among the wives for power, or at least the appearance of it, allows Zhang to suggest disturbing links between past and present. Gong Li delivers a performance of exquisite expressiveness that, like the film itself, is unnerving in its emotional nakedness. Ah... Zhang Yimou has good films. Try and watch the rest of his stuff. All good.